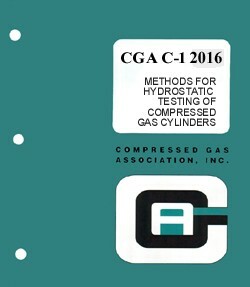 CGA Pamphlet C-1 Methods of Hydrostatic Testing - Latest Edition. U.S. DOT and Transport Canada regulations require cylinders to be tested at time of manufacture and periodically requalified for continued service. In this updated edition, the test methods for cylinders at time of manufacture are now included in this standard. These test methods include volumetric expansion testing, direct expansion testing, and proof pressure testing.